Several mystery and thriller authors have woven paranormal threads into their work in recent years, and it often works well to highlight the powerful forces that move people into evil -- and sometimes the ones that help them survive, instead. John Connolly's series set in Maine, with Charlie Parker taking his best shot against deep old cunning spirits that hate life, provides a haunting rationale for the worst and the best in his terrain. Canadian Vicki Delany provoked heightened Gothic suspense in More Than Sorrow, and Carsten Stroud used hauntings and history to accentuate the wicked cruelty of plantation slavery in his bizarrely compelling detective trilogy set in and around Niceville. 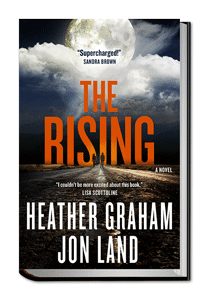 In THE RISING, suspense author Jon Land turns from his mildly spirit-struck Texas Ranger series featuring Caitlin Strong (most recently in Strong Cold Dead) to partner with romance author Heather Graham -- rather unfairly described as a team of two thriller authors, since Graham's main strengths are in he-she tangles interwoven in her plots, as well as straightforward vampire and haunting threads. But unexpectedly, the duo's progeny turns out to be a sci-fi suspense offering featuring a pair of high school students destined to fall in love -- Alex Chin and Samantha (Sam) Dixon. Fair warning: Just a few pages into the book, it's clear there are space aliens involved, as well as an obscure NASA program. If you can bear to read further, there's an enjoyable page-turning suspense romp ahead, as Alex (an apparently White smart baby adopted by Chinese parents) struggles, with Sam's help, to locate and stop an alien invasion, armed with the basic skills of high-school geeks. Alex followed Sam's gaze to the black piece of fabric jewelry, which looked shiny as steel. She had straightened out the one she'd unfurled from his father's wrist. But then it snapped back into place with a whapping sound. "I'm sorry, Alex, I'm so sorry," [Sam] said, easing a hand to his shoulder, which felt hot and hard as banded steel. Jones unfolded the picture he was holding and held it so Caitlin could see a tall, gangly young man with a bad case of acne. "Holy sh**," Caitlin said, not believing her eyes. "I spitted him yesterday bird-dogging a protest outside the Comanche Indian reservation near Austin." ... Jones looked down at the picture. "On a major terrorist suspect yesterday, because he happened to be in the same place as you. Then again, nothing just happens when it comes to Caitlin Strong, does it? You are a genuine force of nature, Ranger." If you're collecting Land -- or Graham -- you'll want THE RISING for your shelf. Otherwise, mystery fans may want to stick with Land's basic Caitlin Strong series instead, in order to keep the wild suppositions within the range of the way every deadly crime haunts its environment and its people. On the other hand, those gathering the YA (young adult) books of mainstream crime authors like Harlan Coben will appreciate this divergence of Land's -- it's really a YA tease wrapped up in adult covers, and it's fun to go along for the ride. NEXT: Straightforward California crime fiction from Jonathan Moore, and the newest British spy delight from Mick Herron. 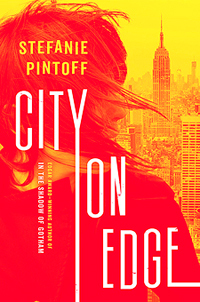 One of the holiday gifts I received -- and immediately dove into -- is the second book in Stefanie Pintoff's Eve Rossi thriller series CITY ON EDGE. What a treat! Pintoff may not yet be a familiar name for suspense readers, but she's earned her stripes, starting with the Edgar Award for Best First Novel for her debut, In the Shadow of Gotham. That began a series featuring New York Police Detective Simon Ziele, set in 1904. Pintoff's move from this "historical mystery" series into pure suspense set in today's Big Apple began with last year's Hostage Taker. Eve Rossi charged into crime-solving with a quirky and dangerous team of her own: the Vidocq Team, made up of convicted yet brilliant criminals whose methods of gaining information are unorthodox but rapid and effective. As an FBI Special Agent with major psych skills of her own, Eve Rossi's first challenge in CITY ON EDGE is to persuade the key Vidocq members to commit to action on behalf of a kidnapped child. Shouldn't be hard,, right? Except it's the little daughter of the city's own police commissioner, and Rossi's team has plenty of reason to dislike and mistrust this leader of a very different kind of force. The cunning and exhilarating setting for the power plays of both the commissioner and the kidnapper -- and Rossi -- is the annual Thanksgiving parade in the city. Yes, the one known to oldtimers as the Macy's parade, with the ginormous balloons of kids'-world characters and the floats where Christmas characters like Santa interact with a crowd of millions. The pressures on Rossi are intense and escalating, and in her new field of thriller writing, Pintoff pushes the "ticking clock" with skill. Most compelling is Eve Rossi herself. Suddenly wealthy through the death of a family member (a death she hasn't yet been able to resolve), Rossi has the kind of independence of Carol O'Connell's Mallory, although she's far more able to interact with people (including criminals). And like Jeffrey Deaver's Lincoln Rhyme, she's turned her newly acquired mansion into an advanced crime-solving lab and headquarters. The quirk of her team composition means if one of them gets on the wrong side of the city police, a long rap sheet works against the situation. How she manages her FBI creds in all this -- that's what Pintoff sets into action, and the book is a true page-turner. Tightly plotted, loaded with explosive surprises, CITY ON EDGE is a classic and classy thriller well worth reading. And although Pintoff doesn't yet bind us to Rossi personally as intensely as she might, I'm more than willing to ride with the series, expecting it to deepen and become one of the powerful and memorable ones as Pintoff continues to push Rossi into the treacherous waters of her career. NEXT review: What Jon Land's been up to with Heather Graham. Seriously.